Every year, humans cut down an area roughly the size of Maine in forest. 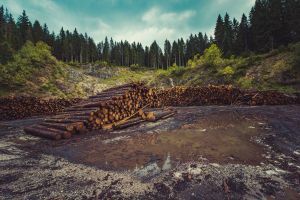 With increasing awareness of the importance of forests for global biodiversity, indigenous livelihoods, and mitigating climate change, many large corporations have pledged that their products will not come from supply chains that support deforestation. According to a recent review paper, action by these big companies will be essential to saving the planet’s forests — but their pledges will have to do more than look good in a press release. According to the Union of Concerned Scientists, beef, soy, palm oil, and wood products make up the biggest cause of deforestation, together leading to the removal of around 3.83 million hectares (around 14,800 square miles) of forest every year. Lambin’s review found that, as of March 2017, at least 447 private producers, processors, manufacturers, retailers, and traders had made a total of 760 public commitments to reducing the forest impact of such products. Yet this talk doesn’t always follow through. When last assessed in 2016, only 20-25 percent of Consumer Goods Forum companies who made sustainability commitments had concrete plans to reduce deforestation. Among the Sustainability Consortium, a group of 43 corporations including General Mills, Mars, and Wal-Mart, efforts to preserve the most precious forest areas has been implemented in less than 50 percent of any commodity. Lambin’s research found that there are lots of reasons why these pledges fail in practice. They can be weakened by vague language, or implemented unequally across different parts of a supply chain. When companies join forces in collective pledges, like in the Sustainability Consortium, the onus of making change is outside of any single company’s control; these collective promises rarely specify who will be accountable for actually doing what the pledge promises, or how to implement it. Lien De Brouckere, Deputy Director of the Africa Region for the Rights and Resources Initiative, says that accountability is one of the main challenges for the initiatives she works with, which largely involve protecting African forests from deforestation by palm oil growers. As De Brouckere describes it, in terms of the carrot and the stick, these campaigns don’t have enough stick. There have been some efforts to bring more “stick” to deforestation campaigns, and strict bans or sanctions have had a measurable impact. For example, the 2006 Soy Moratorium, in which the large transnational grain companies that made up 90% of the Brazilian soy trade pledged that they would purchase no soy from deforested Amazon land. According to a 2015 Science research paper, nearly 30 percent of soy expansion occurred through deforestation in the two years before the agreement; after the agreement, deforestation fell to about 1 percent of soy expansion. Yet Lambin cautions that such sanctions aren’t a cure-all. Strict measures often lead to “leakage,” in which a banned practice simply moves somewhere else, or gets taken over by a different commodity. In the case of the Amazonian soy ban, Mongabay reports that some soy growers simply began deforesting the Cerrado savanna, the highly biodiverse grasslands nearby, and that movement of soy farming onto pasture lands displaced cattle and caused forest to be newly-cut by ranchers instead of soy farmers. The deforestation of our once tree-dominated planet doesn’t just impact individual plants. Tree removal is a significant source of greenhouse gases in our atmosphere; as areas are deforested to grow commodities like palm oil or soy, growers often light the cut trees and undergrowth on fire to clear it, making new land rapidly available for planting. Though estimates vary, research suggests that this burning contributes to between 6 and 17 percent of global human carbon emissions, making land-use change and forestry the planet’s third largest source of greenhouse gases. Additionally, as vegetation is removed, its ability to pull carbon dioxide out of the atmosphere decreases, multiplying deforestation’s impact. As these forests disappear, they also mean the loss of homes for important animal biodiversity, as well as those of local communities who may have lived off the land for generations. Yet De Brouckere says that efforts to curtail these abuses often start small, within indigenous communities. “Communities are not necessarily just going to move away and let the bulldozers come in. They are taking action, creating challenges for those companies,” she said, describing efforts that use technology like mobile apps to allow communities to quickly report environmental violations. Such accountability measures encourage companies to design sustainable supply chains. “Companies are increasingly worried about not doing due diligence and finding themselves in a situation that could have been fixed properly beforehand,” De Brouckere said. Indeed, Lambin emphasized that this was one of the positive takeaways from his review: that individuals have tremendous power in taking action against deforestation. In addition to the action that communities are taking on the ground, buyers all over the world can express their preferences by buying only from reliable companies, as well as being willing to pay a little bit more for those products. Particularly in the era of social media, companies have huge motivations to respond to consumer pressures; to save the world’s forests, you can start by voting with your wallet.